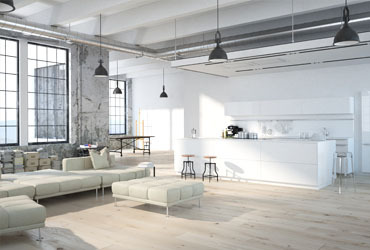 The industrial style has recently made a revival in the world of contemporary home interiors. With a growing popularity for old industrial warehouses being renovated into loft-style apartments while still retaining the buildings industrial heritage. But how do you turn an old warehouse into your perfect home? The great thing about industrial buildings is the sense of space and natural light they tend to offer. Large square footage paired with open plan living adds to the charm and quirky nature of these buildings and allows you a blank canvas on which to put your own stamp on your home! The first thing to identify is the most prominent colours existing within your space. Typically buildings of this nature feature either steel framed windows and brick faced internal walls, or exposed copper pipes and rafters. Based on the palate you have inherited, you will be able to determine how you would like to ‘dress’ your room. For a steel based palate you may wish to inject warm tones into your décor. Soft oak furniture and plush cushions in neutral colours can be paired with brushed stainless steel door handles and light shades to inject a natural warmth to your space, while being sympathetic to the original character of your building. For an ultra-modern finish however, stark monochrome shades are best used. Think black steel window frames with juxtaposing white painted walls for a bold statement and striking impact. Wood finishes are also compatible with copper features, echoing the warm and cosy nature of the rich copper tones. You may however also wish to add a statement colour, for example lime green to juxtapose the warm autumnal palate. Perhaps most important to consider though is texture. Texture really is key when dressing an industrial space to break up the clean linear structures and create a homely feel to your space. Think wood floors paired with warm and tactile rugs to soften the overall appearance of your room. Why not check out our blog on Parquet Flooring for more ideas on how to renovate your home.